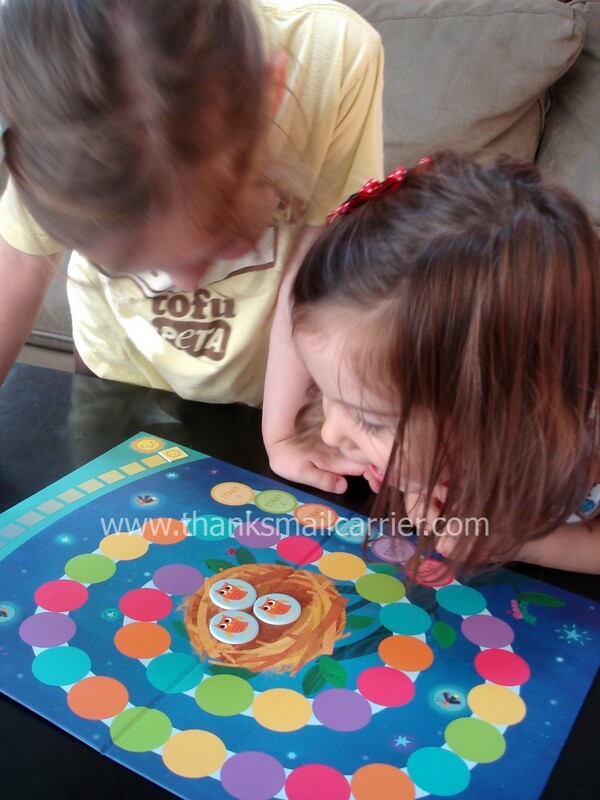 Big Sister E is to the age where she enjoys the interaction and entertainment of playing board games. No longer does she tune out when I'm explaining the concept or the rules, instead I find that she is eagerly listening and nearly almost jittery with excitement to take the first roll or draw the first card. The only problem? Winning and losing. Although those are two aspects that are a part of life, the competitive side to games does, at times, make it difficult to play with young children. No one wants to lose, right? I still have memories of being beaten at every game by my older brother and the way that affected my dislike of playing games altogether, so that's not something that I want to pass along to my girls. Instead, I love that there are companies like Peaceable Kingdom that not only create products and games that educate and inspire, but promote cooperative play! 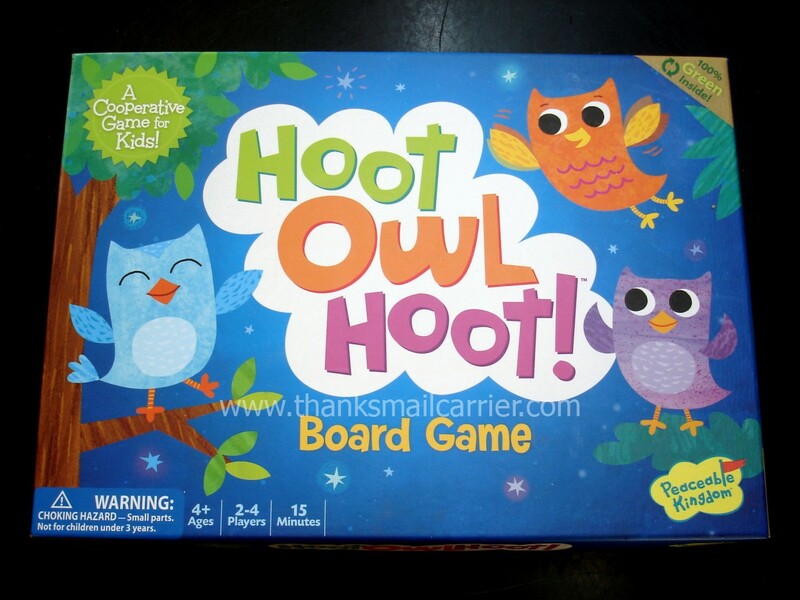 Perfect for the preschool age (4 and up), Peacable Kingdom's Hoot Owl Hoot! 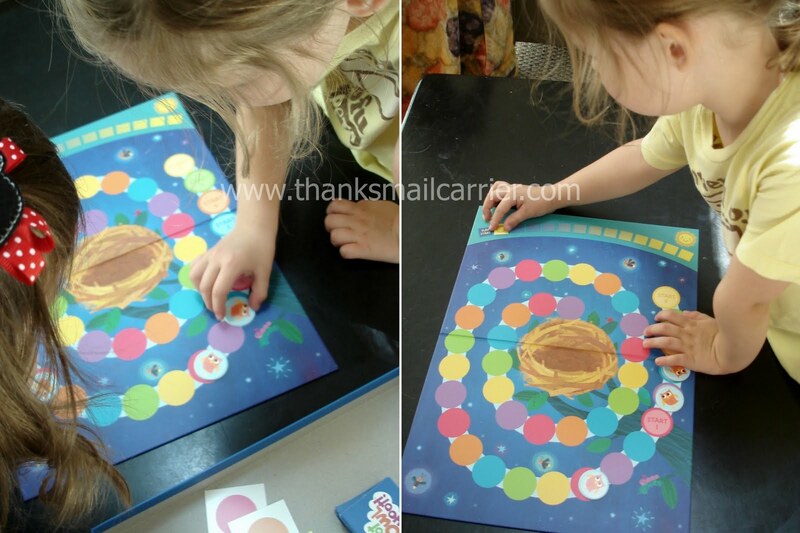 is a colorful, strategic game that focuses on all players working together to complete the task. Instead of competing to see who can make it to the end first, all players are vying for the same outcome (getting the owls to their nest before the sun comes up) and therefore cooperate to accomplish the group goal. Just from the description and the cute illustrations, I was just as excited as my kids to try out this game in person! While the girls were pointing out the adorable owls, I was immediately impressed with the durability and construction of the board game and each of the pieces. 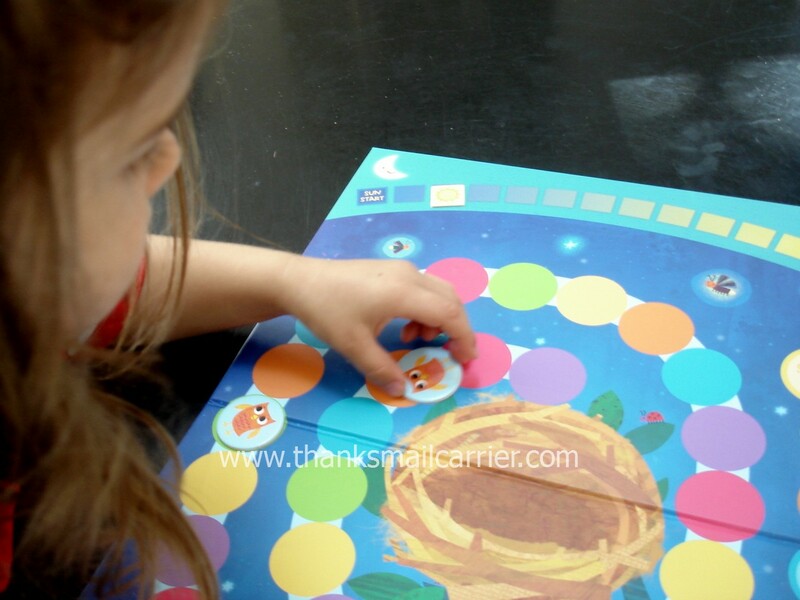 Peaceable Kingdom is committed to socially-conscious manufacturing practices and sustainable and eco-friendly materials... but that doesn't at all mean that the cardboard pieces are at all flimsy or won't hold up to continuous play. I also really liked that the game instructions were clearly printed and laid out right in the underside of the box top, meaning no paper manual to try to not lose or pages getting torn as you flip to find the information that you need. 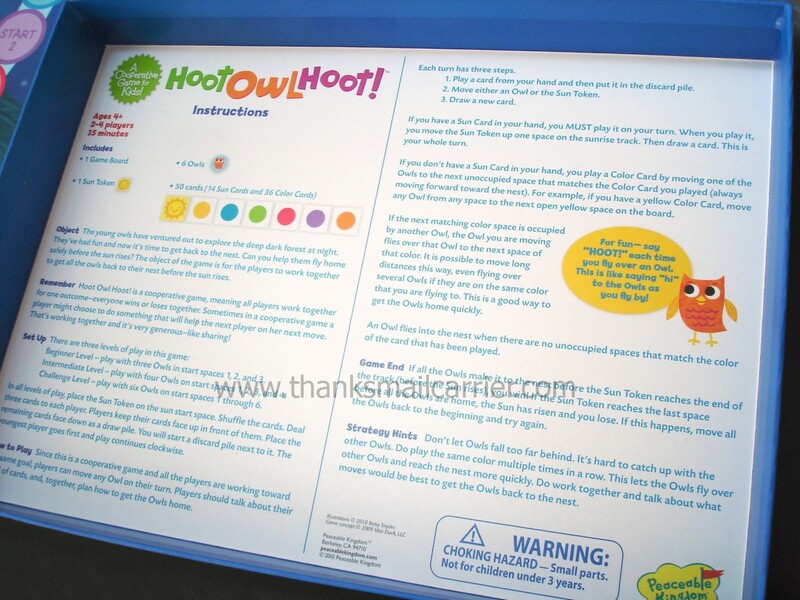 When it came time to play, I was happy to find that Big Sister E caught on easily and was ready to point out which color card to play or how we could best work together to get our owls home to their nest. Moving the pieces along the path was easy enough that both she and Little Sister B could do it without trouble and I liked that they were both practicing color recognition and counting as the owls "flew" to the next space. ...and we won! There were no feelings of one person reigning supreme and everyone else being disappointed, instead there were high-fives and hugs and happiness all around. What a great experience! With competition such a big part of our society, I'm happy to see that there are companies that have found a way to take 15 minutes and boost the confidence, cooperation and teamwork of preschool and early elementary-age children. It's no wonder that Hoot Owl Hoot! has been awarded a 2011 Parents' Choice Silver Honor Award as well as a Major Fun Award - both honors that are not easy to come by! Retailing for around $14.99 on Amazon, more information on Hoot Owl Hoot! 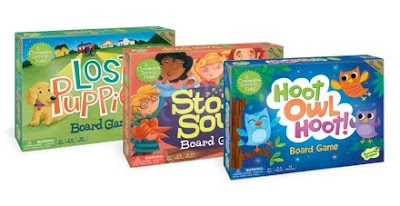 and all of Peaceable Kingdom's innovative games and products can be found on their website. You can also keep up with this impressive company on Facebook so that you won't miss the latest information and news.